Uber’s fight to keep drivers as independent contractors rather than employees has paid off, big time. Since 2009, Uber has saved as much as $730 million by not reimbursing the on-the-job expenses of its drivers in California and Massachusetts, according to court documents that were made public on Monday (May 9). That figure was calculated by the drivers’ attorney and includes an estimated $700 million for vehicle use, plus $30 million for phones. Companies aren’t required to pay work-related expenses for independent contractors as they would for employees. The $700 million figure in the filings was calculated using the business-mileage reimbursement rate provided by the Internal Revenue Service, which accounts for fixed costs like vehicle depreciation as well as variable ones like gas and maintenance. In 2015, that rate was 57.5 cents per mile; this year, it’s $0.54. 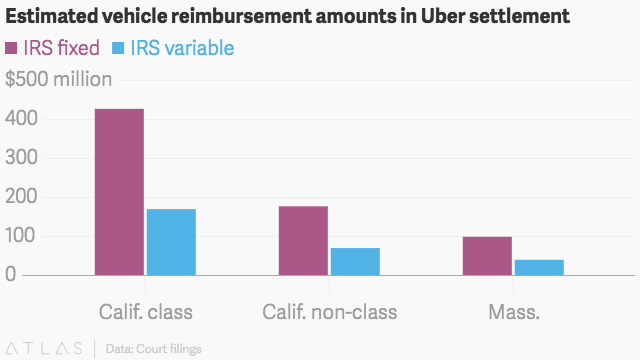 Uber prefers to crunch the numbers accounting only for variable costs—the company argues that drivers would incur fixed expenses like depreciation even if they weren’t driving for Uber. Done that way, the value of Uber’s hypothetical reimbursements to drivers drops to $307 million. Regardless of the number used, both illustrate how much cost-cutting Uber has achieved by hiring its drivers as contractors. The calculations don’t even account for what Uber might have paid in benefits and guaranteed minimum wages were drivers covered by traditional employment protections. Companies are thought to save up to 30% on labor costs by hiring workers as contractors. The court filings also estimate that Uber owes drivers in those two states $122 million in tips. Uber agreed last month to settle a pair of class action lawsuits alleging that it misclassified drivers as contractors for $100 million. Under the deal Uber struck with drivers in California and Massachusetts, the company would pay up and make a few other non-monetary concessions, but the drivers themselves would remain contractors. That agreement is pending approval by a federal judge. Clearly, $700 million is a lot of money, especially considering it’s the savings from just two states. Yes, California is among Uber’s biggest markets, and its oldest, but you can start to imagine how much money Uber might have to pony up if it owed reimbursements to drivers nationwide. For a bit of context, that savings alone is more than the $663 million Uber reportedly generated in net revenue for the first half of 2015. No wonder it’s been so dead set on keeping drivers as contractors.